Mar 19 Comments Off on Under your skin. With time, sun exposure, ageing and genetic changes, our skin becomes less compliant, thinner, more wrinkled and sagging. There are, however, numerous treatment types we can choose from to help reduce or reverse these changes. With these treatments, the skin is essentially subjected to a controlled, limited depth, mild injury that stimulates it to heal and recover. Part of the recovery is to deposit collagen, resurface the upper layers and tighten the skin. Benefits, when combined with good skin care and sun protection, may be long-lasting. There is a balance between outcome, recovery and depth of treatment. The deeper or more severe the treatment, the more significant the result but this is at the expense of a longer recovery and more downtime. More superficial treatments may need to be repeated to obtain similar results but each treatment has little or reduced downtime and recovery. Treatments can be chemical (chemical peels), physical (needling, dermabrasion, microhydrabrasion), light-based (laser, IPL, Fraxel) or radiofrequency (thermage). Skin peels can be superficial, medium or deep. Modern superficial and medium depth peels are very popular and slough away and peel the upper skin layers. Rejuvenated skin is smoother and less wrinkled. Pore size and pigmentation may also be improved. Pretreatment requires skin preparation to optimize the results. An anaesthetic is not usually needed with these peels (deep peels usually need an anaesthetic). Face, neck and chest are usually combined in a single treatment. Hands may also be treated. Examples are alphahydroxy acids (superficial), tricholoroacetic acid (medium) and phenol (deep) peels. Skin needling uses a roller containing fine, medical grade needles that is rolled over the skin surface. Multiple small holes are pierced in the skin, stimulating new collagen growth and improving texture. Needle length varies from shorter more superficial rollers, used at home, to longer, deeper penetrating needles used by practitioners. Fibrous scar tissue may be softened. The results are progressive and improve over months. Care must be taken with poor scar tendencies and keloid scarring. Repeat treatments or ongoing home treatments maintain the results. Microhydrabrasion is a superficial exfoliation technique. Dermabrasion is deeper and removes the upper skin layers. Either a rotating burr or brush is used. Small or large areas can be treated. Again the healing process stimulates collagen and the new skin surface is smoother, fresher and finer textured. Scar tissue and pigmentation can be removed. IPL or Intense Pulsed Light uses light energy to cause a recoverable, mild skin injury. It is very useful in treating pigmented areas, small red blood vessels and broken capillaries because the darker- coloured tissue preferentially absorbs more light energy. Adjacent lighter areas absorb less. Increasing the wavelength of IPL allows deeper penetration in the skin. 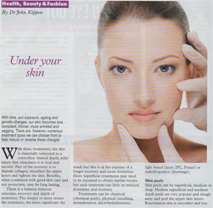 Healing then tightens the skin as collagen is deposited. Fraxel uses individual columns of light that penetrate the skin. Collagen in the surrounding skin is stimulated to heal these columns. Columns are replaced and collagen is deposited in the skin, improving its appearance. Treatments can be repeated and downtime is proportionate to the density of treatment. Thermage uses radiofrequency to impart heat to the deeper, collagen-rich skin layers. Healing stimulates this collagen which tightens and may lift the skin. All skin types can be treated as skin colour is less important in the procedure. Some immediate results are visible but the changes usually progress gradually up to six months. All these treatments should be supplemented with ongoing skin care and sun avoidance. Good Quality cosmeceutical products, used daily, will maintain and prolong theses changes and results. They also increase the interval between any subsequent treatments. People consider cosmetic surgery for all manner of reasons. In the end, however, it usually comes down to confidence and self esteem. Cosmetic surgery can not only help you look better and feel better, but also help bring out the real you.